Bruce played the r hythm guitar and the penny jar and the recorder and wrote and sang almost all the songs that weren't written by people we didn't know. Robert played the lead guitar and wrote or co-wrote a few songs and sang half of "Bitchen Party" and the "holiday songs" (the ones whose titles start with "It's). Jim played the drums. Doug played the bass guitar and sang harmony vocals and wrote "Robert's Camera." Lloyd played the guitar and the trumpet and gave us "Coins." David played the bass before Doug. Anne and Michele danced and sang. Glenn and Ellen made a video of "Bitchen Party" that played some on the television. Click here to see. 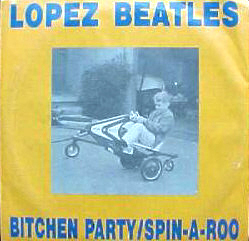 The Lopez Beatles are still a band, but a band that (almost) never plays. Many of the links below now have audio. See pictures here. You can also visit and hear the Lopez Beatles at Facebook, MySpace and YouTube.